“Did you say something? I didn’t hear you. We are both busy being Awesome Eaters!” :) …What am I munching on? 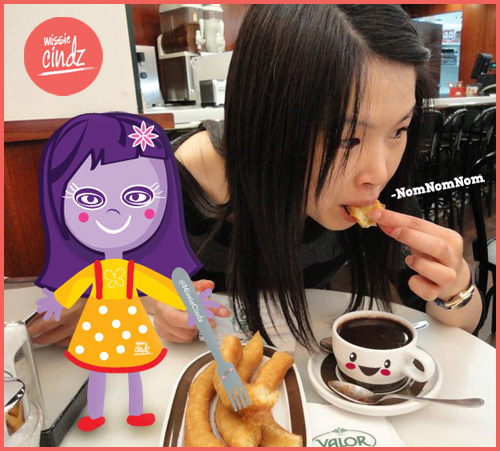 I hear you ask – it’s called Churros (sometimes referred to as a Spanish doughnut these are fried-dough pastry-based snacks) and is accompanied with a cup of hot chocolate (100 per cent melted thick chocolate!). If you fancy trying Churros in the UK (I’ve not seen these fellas being sold in Sheffield?) but there’s a little stand every Saturday in Portobello Road Market (London – outside the Electric Cinema W11 2ED) – 9am – 6pm http://www.churrosgarcia.co.uk or if you’re ever in the Kings Cross/St Pancras area, just a couple of minutes down the road is the British Library is Peyton & Byrne Café http://www.oliverpeyton.co.uk – you’ll find these calorie-laden treats in there too!